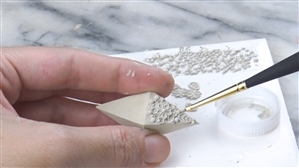 Wanaree Tanner began her metal clay career in 2008 and remains in the forefront of innovation, technique development and tool invention. She created this video which provides detailed instruction on how to use her Signature Hollow Form System. After the form is created and dry, Wanaree adds beautiful embellishments using her Signature Die Cut Tools and Calibrated Cutters. Note, the link above also includes a downloadable pdf that provides step by step instructions.